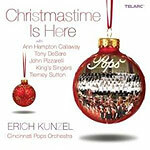 CD review: "Christmastime Is Here"
To be perfectly honest, not everyone will like this release. It's an over-the-top spectacle that comes awfully close to treacle at times. But in its deliciously balanced combination of classical, choral and jazz traditions, maestro Erich Kunzel has created the sort of glittery holiday extravaganza we once would have gotten from Leonard Bernstein or Eugene Ormandy. And so those of a certain age will find this album taking them back to Christmases of long ago. The Indiana University Singing Hoosiers remind of the often-dismissed easy-listening vocal groups of the 1960s, like the Ray Conniff Singers or the Norman Luboff Choir. Lush, thick-pile vocal harmonies that might grate elsewhere on the calendar somehow comfort during the holidays. The cabaret-styled arrangements for singers Tony DeSare and Ann Hampton Callaway recall the classic crooners, while jazz singers John Pizzarelli and Tierney Sutton bring a bit of grittiness that leavens things a bit. The recording quality is top-notch, and if some of the arrangements are just too much  well, it's the holidays, after all.